Upgrading LogInsight 4.0 -> 4.3 fails if TLSv1 is disabled! 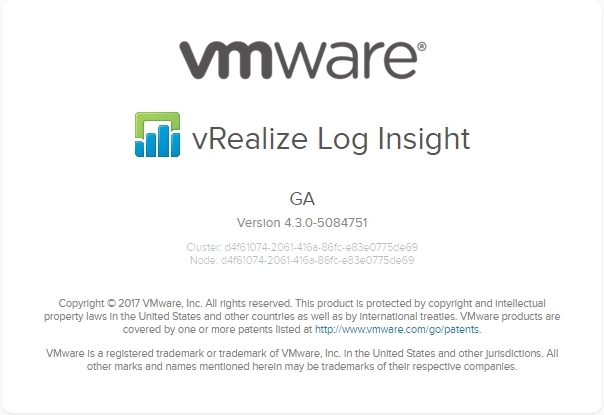 Home » VMware » Upgrading LogInsight 4.0 -> 4.3 fails if TLSv1 is disabled! Hi all – I know I promised to follow up with more LogInsight posts and I intend to follow through! However, as a brief interruption to that blog series (available here), I wanted to let everyone know I’ve upgraded one of my environments from LogInsight 4.0.0-4624504 to 4.3.0-5084751 but not without issue. 2017-03-14 13:39:15,182 loginsight-upgrade INFO Certificate verified: VMware-vRealize-Log-Insight.cert: /C=US/ST=California/L=Palo Alto/O=VMware, Inc.
2017-03-14 13:39:38,877 loginsight-upgrade INFO Current version is 4.0.0-4624504 and upgrade version is 4.3.0-5084751. Version Check successful! 2017-03-14 13:39:38,878 loginsight-upgrade INFO Disk Space Check successful! 2017-03-14 13:39:45,301 loginsight-upgrade INFO Checksum validation successful! 2017-03-14 13:50:01,728 loginsight-upgrade INFO Done! Again, there’s really nothing obvious in the output. However, the text in red suggested something was up with an unknown protocol in regards to SSL. Hrm. Well, actually, as is best-practice, I disabled TLSv1 on all of my environments. So, as a long shot I thought I would re-enabled TLSv1 in case there was some sort of validation being done. You can read this KB on how to disabled TLSv1 (and thus re-enable it if needed). 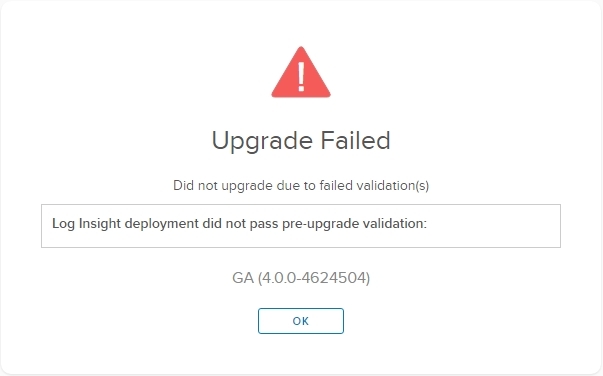 It turns out that after re-enabling TLSv1 on the LogInsight 4.0 appliance, my upgrade went through successfully! vmware-tools-vsock-common-10.0.9-5.sles11.x86_64 has already been installed. vmware-tools-vsock-kmp-default-9.8.1.0_3.0.76_0.11-5.sles11.x86_64 has already been installed. vmware-tools-vsock-kmp-trace-9.8.1.0_3.0.76_0.11-5.sles11.x86_64 has already been installed. 2017-03-14 14:22:42,280 loginsight-upgrade INFO Successfully upgraded to version 4.3.0-5084751! 2017-03-14 14:22:42,280 loginsight-upgrade INFO Done! Just a heads up to those who may be upgrading their appliances! Disabling TLSv1 is definitely a good idea, but in this case it bites you in the upgrade process! Good luck and feel free to let me know if you have similar or opposite experiences! Do you know if it is by design? Not a huge ordeal, but I have a number of environments that I’ll need to make the change on. Great – thanks for the info!